Bringing all the functionality of the renowned Windows-based .zip handler to your Android phone and tablet, WinZip Computing has released an official app to Google's Play Store. 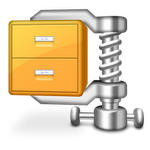 WinZip for Android, in keeping with its PC counterpart, handily opens zipped files, also offering support for encrypted files (including AES128 and AES256), promising secure viewing and transmission of sensitive data from your mobile device. The app also features sophisticated third-party app integration to open .doc(x), .xls, .ppt, and .pdf files, while offering built-in support for image files, text files (from .txt to .csv, .bat, .js, .xml, .css and many more), web files, and .apk files.